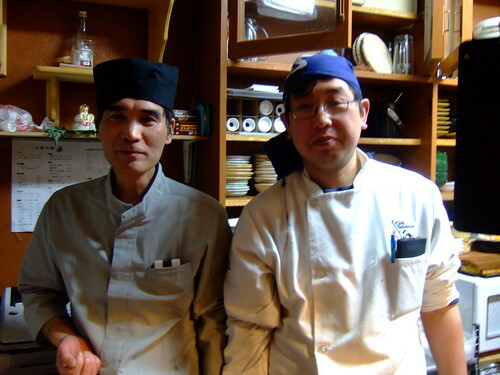 Saito-san gave me a call last week to ask if we wanted to reserve for New Year’s Eve. And so last night we walked down the hill and joined three groups of men who were merrily into the shochu when we slid open the door. 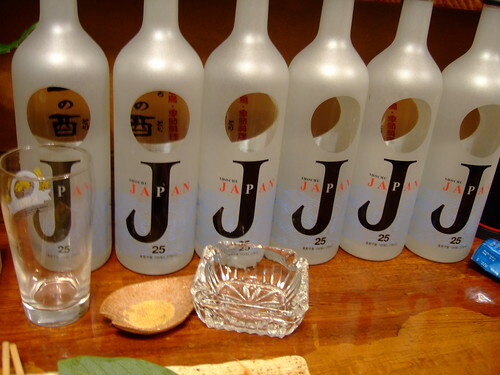 We started with Aoi me no samurai (Ichi no Tori‘s featured local sake, a tasty, full-bodied pure rice sake). 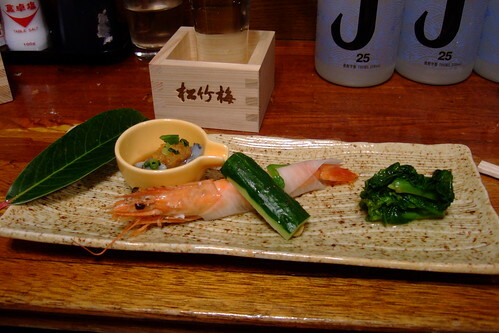 Photo: The starter (from left): namako (sea slug) in a dressing of vinegar, red peper, mirin, and green onion, cooked shrimp wrapped in a thin slice of daikon, cucumber with a dab of white miso, steamed broccoli rabe. 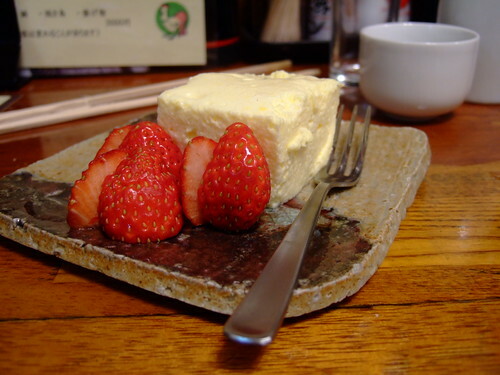 Not pictured: shitake mushroom skewers and negima (chicken and Japanese leek skewers). 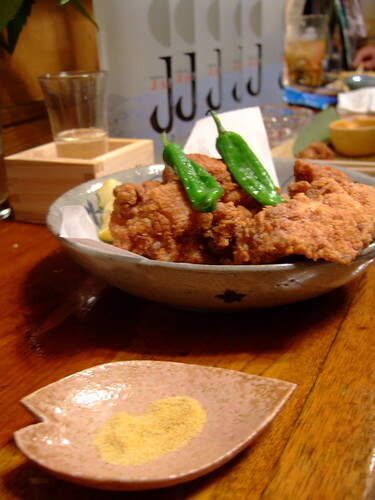 Photo: Fried Oyama chicken with curry salt. At one point, four of us started singing along with the music on the stereo, but now we can’t remember what the song was (my god, was it something by the Carpenters?). Everyone knew the words in English and we were belting it out. 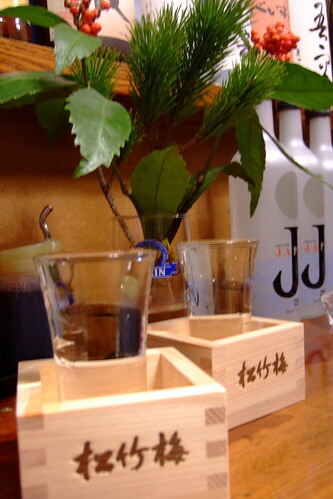 Photo: Bottles of the house shochu. 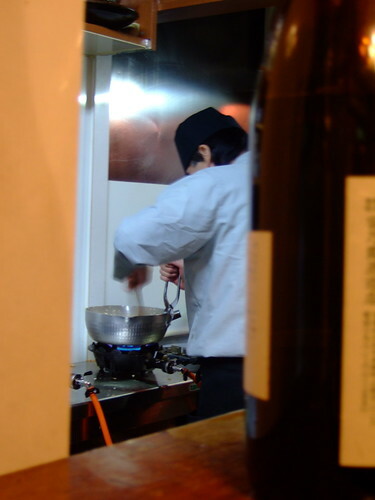 We tried a second sake: Suigei ginjo. The “Drunken Whale” had a pronounced grapefruit nose; the taste started soft and classic, but finished fresh and tart on the back of the tongue. Yum. 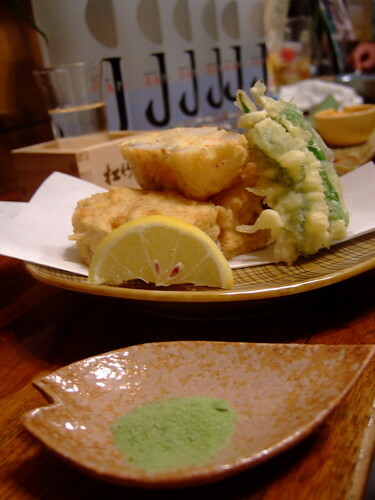 Photo: Lotus root stuffed with shrimp and egg and deep fried, served with green tea salt. 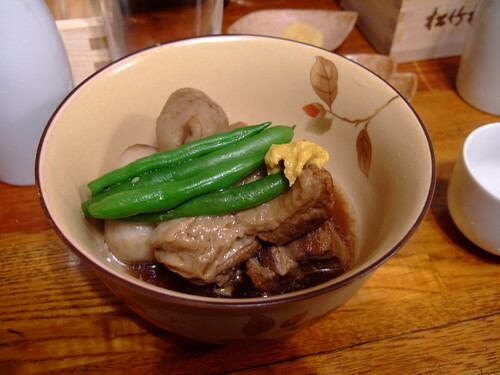 Photo: Buta kaku ni (stewed chunks of pork belly and green beans), served with Japanese mustard. Not pictured: a sabisu (complimentary) salad of okara (soy pulp left after pressing soybeans for tofu) with scallions, carrot, and kamaboko (fish paste sausage). Dan Fogelburg’s “Leader of the Band” starting playing at this point, and we got a little maudlin about his death this month.